These are the true Snowdrops not snowflakes. 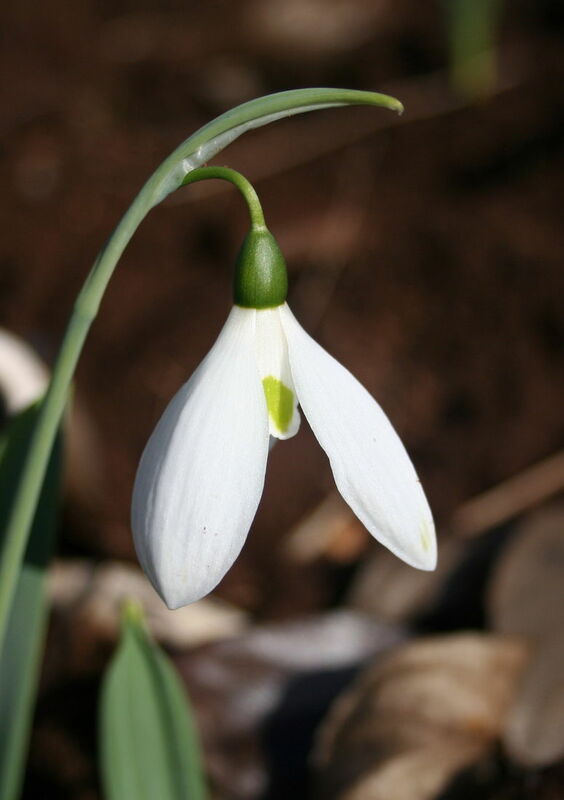 The genus Galanthus first established 1753 is derived from ‘gala’ meaning milk and ‘anthos’ meaning flower. A genus of 18 or more species with up to 500 named cultivars. They are predominantly native to the Europe, west from the Pyrennees to the Caucasus and the Caspian Sea in the east, where they occur in or on the edges of mainly deciduous woodlands thus receiving plenty of light and moisture during their growing and flowering period then shelter from the summer heat whilst dormant. Their snow-white pendant blooms which herald the coming of Spring appear from late Winter to Spring. The blooms are made up of 6 segments, the outer 3 are larger “resembling a skirt” which opens and closes depending on the temperature, thus showing off the inner smaller petals. These inner petals have various green markings, depending on the variety (there are some newer, not readily available, cultivars that have yellow markings). Flowers can range from 15mm for G.nivalis and G.rizehensis through to 30mm in length for G.caucasicus and many of the cultivars. Stems range from 10cm to 20cm in height depending on variety. They are very frost hardy and do best in a cooler climate. Clumps are easily established if left undisturbed for a period of time. Enrich the soil with blood and bone and some lime if available. Normal spring rains are usually adequate but if season is dry please water once a week during their growth cycle. One of ‘Mother Nature’s’ truly delightful must haves!